Continuing its interminably drawn out roster reveal, Capcom has issued two new character teasers for Street Fighter X Tekken, alongside the game's official box art. 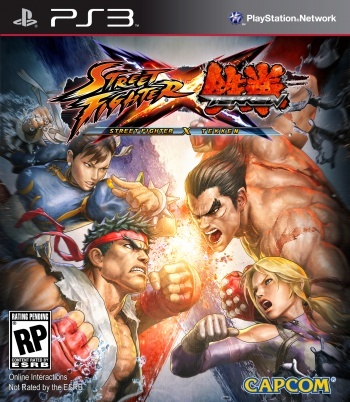 The game, which pits characters from Capcom's Street Fighter series against characters from Namco Bandai's Tekken games is a 2D fighter in the same vein as Street Fighter IV. Instead of that game's one-on-one pugilism however, SFxT features team battles akin to the Tekken Tag Tournament games. It's scheduled for release on the Xbox 360, PlayStation 3 and PlayStation Vita on March 2, 2012. While two-thirds of the media released today is somewhat ambiguous, the first bit -- that image you see at top-right -- is a pretty clear cut example of box art. Street Fighter mainstays Ryu and Chun Li are milliseconds away from clashing with Tekken notables Kazuya Mishima and Nina Williams. The latter pair may have the advantage in recognizable surnames, but the former have been punching people in the face for over two decades at this point, so until the game hits shelves, we'll call this one a push. The two character teasers however, don't lend themselves to such clear-cut descriptions. As with the game's previous teasers, we're given snippets of body parts emblazoned on shreds of torn paper, and tasked with guessing which familiar fighter is being portrayed. I'm going to posit that the first one is Heihachi Mishima (honestly that one's not incredibly difficult), but the second teaser is a bit harder. Going by past teasers, and given that the first was a Tekken fighter, the second would have to be a Street Fighter cast member. I'm going to discount that momentary image of Sean's basketball, because c'mon, Sean? Really? Mega Man has a better chance of appearing in this game, and we all know how Capcom feels about the Blue Bomber of late. That said, based on belt buckle size, and overall color scheme, I'm going to say Rolento. Would anyone care to disagree?